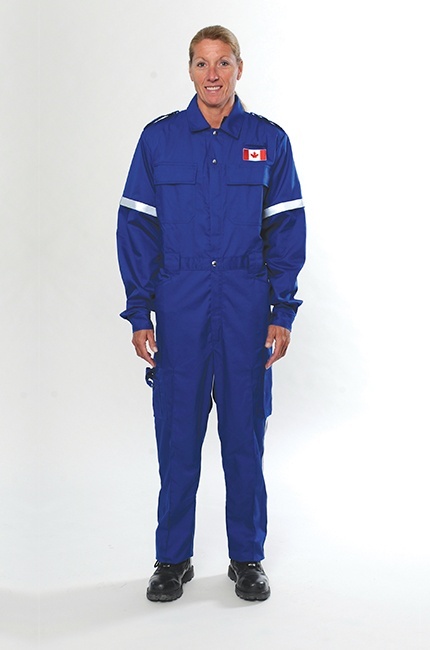 This professional jumpsuit is made specifically for EMS first responders. With multiple pockets and highly reflective surfaces, it's always ready for the call. Flame-Resistant: Built with flame-resistant, NFPA 1975 compliant DuPont™ Nomex® IIIA fiber. Easy Donning/Doffing: Features full-length, two-way front zipper closure with material shield. Plenty of Pockets: Two western-style pockets, two full bellows thigh pockets, and two seat pockets with flaps. Comfortable Fit: Elasticized waistband for comfort and a flexible fit. Always Professional: Epaulettes and sewn-in leg creases for crisp, professional appearance. Better Mobility: Action back design for better mobility. Easy Visibility: 3M™ Scotchlite™ Reflective Material around arms and on leg outseam for maximum visibility — one-inch silver. Customizable: Available in different materials and sleeves. Choose from short, long or removable sleeves.